Photo shoot at Rams Supermarket, Buckleys. Basseterre, St. Kitts, 27th May, 2018 – The Rams Group of Companies has joined the list of partners for the 2018 edition of the St. Kitts Music Festival. 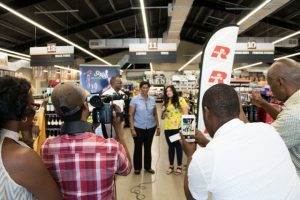 In a 24th May handover ceremony held at the Buckleys branch of Rams Supermarket, Kiran Chandiramani-Perkins, Marketing Manager of Rams Group of Companies, said the company was pleased to continue its support for the St. Kitts Music Festival.